The demon has defeated the first group of magicians sent up against it. So the Office of Occult Affairs sends in a new team to support the old one. For Harry Eberhardt, one of the magicians, work isn’t just an opportunity to slay demons. Nope, it’s also a chance to score with women, colleagues not excepted. As Harry will tell you, “I drive women mad” in chapter 7 of Magician’s Misfortune, and so he does! Magician’s Misfortune is my weekly serialized story about Harry Eberhardt, expert demon slayer working for the Federal Government, a true ladies’ man (at least in his own mind), and the assignment that takes him to Farnham. If you’ve not been following the story, you can start here at the beginning. And a new chapter goes up every Friday morning. This entry was posted in Magician's Misfortune, Writing fiction and tagged fantasy, Fiction, Magic, memory-tampering demon, supernatural, Writing. Bookmark the permalink. 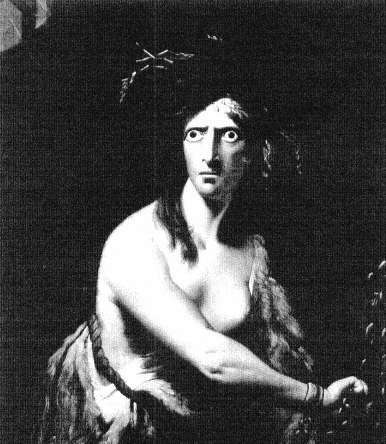 Is the picture by Henry Fuseli? Kinda looks like one of his, though I don’t actually recognise it. It’s said to be a mezzotint based on a portrait by Robert Edge Pine (1730-88), whom I’d never heard of before, but who was a famous Anglo-American artist in his day. Ah. Some quality of the face makes me think the female qualifiers have been grafted onto a male torso. Causes a kinda double take. I picked it off a website that discusses the iconography of female hysteria, which informs me her depiction implies she’s a dangerously powerful lunatic.